Possible Life... But Not As We Know It! Goldilocks is synonymous with the adage "Not too hot, and not too cold", famously adopted into the proverbial lexicon from a 19th century English fairy tale by Robert Southey. To contextually transfer this into astronomical 'NASA Geek Speak', it could be referred to as the "Habitable Zone", where conditions are not too hot, or not too cold for biological life to exist and evolve. ​NASA made a major announcement this week that it discovered a Red Dwarf Star which was orbited by seven earth-like sized planets. A Red Dwarf is a small star, which can range in mass from a low of 0.075 to about 0.50 solar mass [solar equating to the size and mass of our own sun]. ​This particular Red Dwarf, called Trappis-1, is slightly larger than the planet Jupiter and 12 times less than our sun, located in the constellation of Aquarius, approximately 12 parsecs (39 light years) from earth - in galactic terms that is close and neighbourly considering the Milky Way Galaxy is measured as 8,000 parsecs (100,000 light years) across. 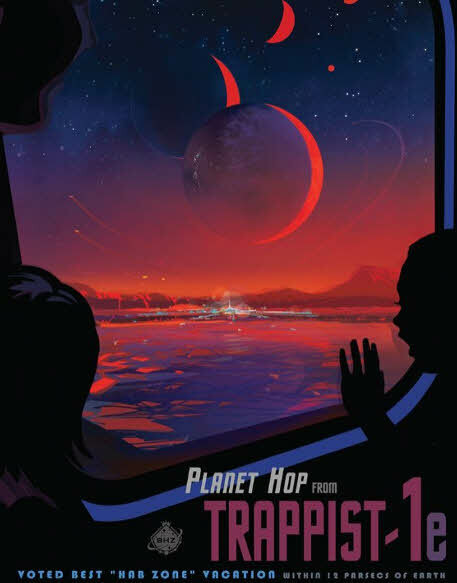 A NASA tourist poster with an artist's impression of travelling the Trappist-1 system, looking out from Trappist-1e, which is 0.92 the size of earth. Aquarius in Greek mythology is the water and wine cup bearer of the gods who was known as the one who unleashed the waters on earth. The Trappist-1 solar system was named after the NASA telescope which discovered it. The seven celestial planetary bodies currently believed to orbiting the Trappist-1 Red Dwarf have all been measured by NASA as being very close to the diameter size of earth, thus giving them similar gravity to earth. ​There are too many exoplanets [planets outside our solar system] in the Milky Way Galaxy alone, let alone the wider universe, to start giving them all unique meaningful names. ​As such these seven planets have been alphabetically identified along the scale of "B" to "H". ​Three planets, Trappist-1 "E", "F" and "G" are considered to be in the Goldilocks habitable zone for life to develop. ​The planets all orbit very close to Trappist-1. Because the Red Dwarf is small then the planets do not become too hot. However, it is suggested that because they are so close they have become tidal locked to the Red Dwarf which would keep one side of their planet in perpetual darkness and the other side in perpetual light. The twilight zones between light and darkness could be where life has most chance of existing. This is where scientists suggest forests and swamps could form - between the scorching lands always facing the sun, and the gigantic ice frozen lands in perpetual darkness. Because of the extreme temperature differences, winds within a thick water-based atmosphere would be stronger and distribute warmth around the planets faster to mitigate the destructiveness to life. What is for certain is that humans, through space agencies such as NASA, continue to expand their knowledge with science-based facts. This can lead to a greater level of intelligent questioning about the galaxy and cosmic heavens we live within. Consequently, NASA will continue to push the scientific boundaries in an attempt to answer one of the greatest questions of human history - whether life on earth is alone as the only biological life form, intelligent or microbial, in this physical universe? If we are not, then it's obviously life, but not as we know it ... yet!